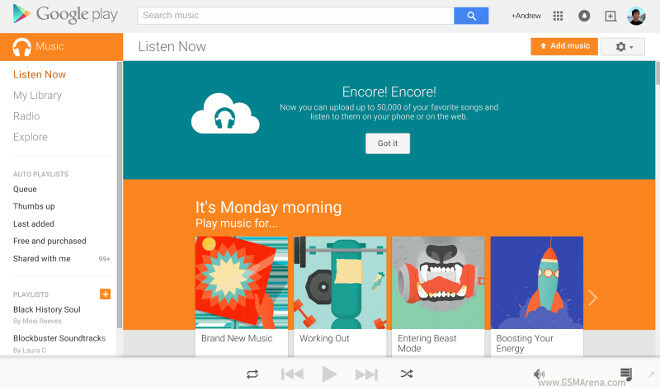 Since its launch, Google Play Music has allowed you to upload and store up to 20,000 songs in the cloud. This has been a key differentiator for Google’s service, since you don’t have to rely solely on its collection – if you’ve got some tracks that it doesn’t, just upload them and then you can stream them to any device. This limit has now effectively been raised to 50,000 – that’s how many of your own songs you can store in Google’s cloud from today. So we assume very few people will not be able to upload their entire music collections to Google Play following this move. Once in the cloud storage locker, your songs behave just like ones that are in Google Play Music’s 30 million-strong catalog. You can listen to them from all supported devices, that is. And even download them to your Android or iOS device for offline listening. Storage of those 50,000 tracks works independently from Google’s All Access and Music Key subscription services, so you can upload your collection even without being a paying customer.